In response to code in the back-end of the Fb app, The Social Network might soon look to deliver messaging again into the primary platform, versus redirecting users to its separate Messenger app. As you'll be able to see right here, code hacker Jane Manchun Wong has situated a brand new check which renames messaging as 'Chats' and keeps those interactions in the primary app, as opposed to opening in Messenger. 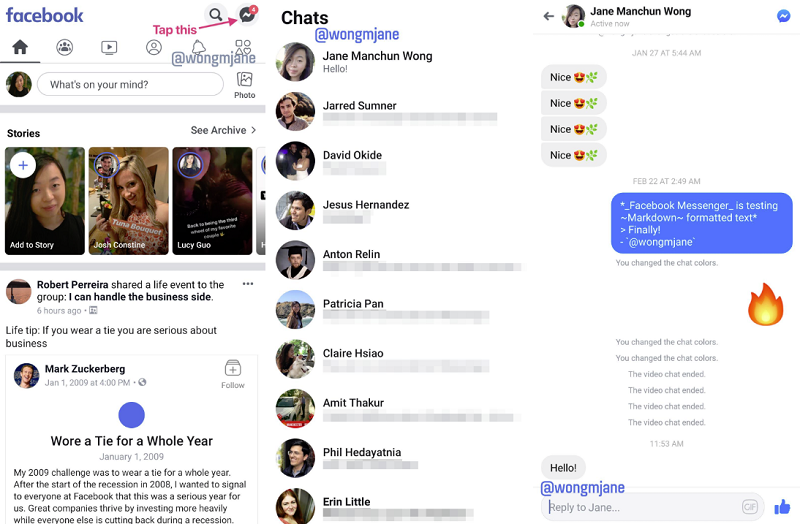 Wong notes that the 'Chat' choice doesn't embrace all of the messaging functionality out there inside Messenger, however it will allow users to interact inside messages without having to modify to the separate app. Facebook initially had its messaging instruments integrated into the primary platform, but spun them out into Messenger back in 2014, controversially forcing users to download Messenger to take care of reference to their pals. That gave Fb an entire new, multi-million (now billion) consumer platform, however the firm was largely criticized for the play, and the Messenger app was savaged by reviewers in consequence. Now, with Facebook planning to lean additional in the direction of private messaging, and ultimately integrate its various messaging platforms, it is apparently trying to roll again its strategy. “We're testing methods to improve the messaging experience for individuals inside the Fb app. Messenger stays a feature-rich, stand-alone messaging app with over a billion individuals using it monthly to connect with the individuals and companies they care about most. We shouldn't have any further details to share right now." The change might make it easier to attach with customers by way of messaging, however it might additionally take a number of the focus away from Messenger as a connective platform. As noted, there would nonetheless be functionalities inside Messenger that might not be replicated in the primary app, but when users need not change across the Messenger to take care of their conversations, perhaps they will not, which might influence general Messenger usage. Fb might be building a problem for itself - if customers do not have to modify to Messenger, perhaps Facebook is tasking itself to make the Messenger app extra interesting, with new tools and features designed to continue to attract users in. Or it might be making an attempt to raised stability on-platform engagement across the two apps - while Messenger use has been rising, engagement within Fb's foremost app has, reportedly, been in decline. By enabling messaging on Facebook, perhaps it loses some engagement on Messenger, but features some on Facebook, better balancing its general time spent, and augmenting its subsequent advert potential across the 2. Either method, it's an fascinating consideration - there is no phrase on any official roll out as but, and we'll hold you up to date on any modifications. Additionally value noting - in the screenshots above, you'll have observed that the Facebook header is on a white background. This is part of a separate test of its in-app presentation and branding, which has not been rolled out to all users as but.